A friend sent me this. Thought it was worth a chuckle. Did you hear about the dyslexic agnostic? He lays awake at night, wondering if there's a DOG. Even being an agnostic (a humble athiest?, haha) I don't find that offensive in the slightest. More people need to stop, take a deep breath, and laugh. Too many people who are too easily offended...usually just to stroke thier own vanity. If more people laughed, took things at face value instead of looking for ways they could possibly be offended, this world would be a much happier place. And I am agnostic (humble atheist? haha). Too many people looking for offense in every place they can find it. What happened to a world where people could laugh, at themselves as much as others? Would be a much happier place if things could be taken at face value more often, instead of always having to be divided by race, religion, gender, etc. I will offend atheist readers, they're idiots. I'm a Christian and have never thought atheist readers were idiots - I prefer to use the "agree to disagree" approach. True Christians don't get offended, we've been warned to expect it. Comes with the territory. Obviously us Godless heathens are idiots...I accidentally posted my first comment twice...then re-wrote it when it appeared that it didn't go through! BTW Duke, just because someone doesn't agree with your personal philosophy, beliefs, or faith, does not make them an idiot. Just someone with a different view of the world around them. The fool says in his heart, “There is no God." 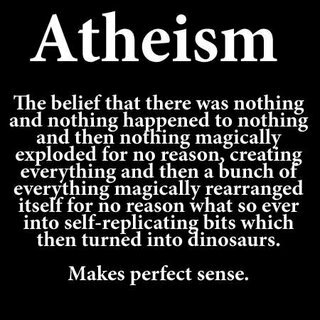 These is no such thing as atheists. God dosen't believe in them. From one of those great church signs. That church was wrong then. I get a kick out of the folks who seemed obsessed about 'exit strategy', yet lack one themselves. They are both humorous, however the Christian one at lest tells a more interesting story - there is nothing more boring than nothing! A more accurate description would be fools (Romans 1:20-22), not idiots (though not entirely disagreeing with you, Duke). I was a fool once not so long ago, even an idiot, until the Lord did what He had to do to open my eyes. I live my life according to this philosophy: If you can imagine it, it probably exists somewhere. All kidding aside, if I had to live the rest of my life with the thought that Mom no longer existed and wasn't with God after she died, it would be unbearable for me, and I would probably much rather be dead so I wouldn't have to think that anymore (and if there really was nothing after life, I wouldn't have to think at all either). Stephen Hawkins recently claimed that the universe didn't have a need for a god to exist and was quite content with it (I watched the program with Dad, who is somewhat of a Hawkins fan because he always wanted to be an astronomer). I seriously don't know how that man lives. He loves the idea that everything he experienced in his life is going to be wiped away once he dies, as if he never existed. I wonder if he ever considered the possibility that despite the evidence he has, that reality could still be on the opposite end of the spectrum from what he thinks it is. One thing I've learned in life is to NEVER put God in a box, even if you're questioning whether he exists or not. Why are atheists offended and threatened by something they don't believe in??? The are both meant in jest, the main difference is that one is factual and one isn't. Religion, though perhaps beneficial to some individuals has caused a lot of intolerance and injustice all over the world and that is why atheists are sometimes offended and threatened by it. Interesting to note that of the two "humorous" descriptions, the one describing christians uses a derogatory term "Zombie" for its founder. But then, I guess it's a bit difficult to call "nothing" any names. How is this fair? 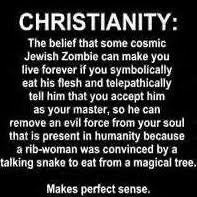 Referring to our Lord who suffered and died a brutal death so that we can spend eternity with Him a "cosmic Jewish zombie" is not funny in the least. There's a big difference between poking fun at an idea, and mocking someone I (and many others) are in love with. I know God is big enough to take it; but it hurts my heart just the same as if someone had said those horrible things about my husband or one of my daughters. Interesting that any outrage has been expressed by the Christian readers when the original jest was made at the expense of Athiests (which was admittedly funny). I don't feel offended, threatened, or angry but it seems that those of faith may be harboring some of these feelings. What people of faith (any religious belief) need to understand is that, while they believe with all their heart and soul in their God (or whatever name He may have), others may not share their beliefs. Calling others "fools" and "idiots" because they do not have the same beliefs is close minded and judgemental (Luke 6:37 states "Judge not, and ye shall not be judged: condemn not, and ye shall not be condemned: forgive, and ye shall be forgiven")...and not very neighborly. Galatians 5:14 "For all the law is fulfilled in one word, even in this; Thou shalt love thy neighbour as thyself." I have read the Bible cover to cover and discussed every verse. I have studied comparitive religion. I have had four years of Theology classes. I have my own beliefs...but am humble enough to realize that I am just a speck on this Earth...and I don't have all the answers. I choose not to believe in a higher power due to my experiences...I cannot say with a certainty that there isn't one. I choose to live my life to be the best person that I can, to my family and those around me. I contribute to my community and do volunteer and charity as well. If I find there is a God and a Heaven when I die, I believe that I will be welcomed with open arms based on the way I have lived my life, not the amount of time I spent on my knees in worship. The 'judge not, lest ye be judged' quote is, in my opinion, misunderstood. I take it to mean 'go ahead and judge, but be prepared to be judged in turn.' We all make judgements day to day, practical ones, and ones that may potentially avert disaster in the future or even save a life. There's a big difference between normal judgement and being judge-MENTAL. I do believe that living one's live in a beneficial way is more important than how structured your worship is, but then when that worship is done voluntarily and as a way to bring a community together (us human specks on the Earth LOVE congregating with like-minded people), it can inspire amazing works. And don't forget the heart one has to put into one's works and/or worship, otherwise its just an empty gesture used for one's selfish benefit. I find it funny that some had to point out Christians being the most outraged ones here, as if that justifies anything (we're all imperfect human beings, don't ya know), when I've been in places in real life and on the web where atheists go on angry tirades about how much of a bad person I am for being a Christian. One actually said that even mentioning in passing that you're a Christian is offensive. My sis had temporarily joined a Facebook group made up of friends that turned into an atheist pity party, and trying to explain her side to these people practically made her head spin and finally she had to step away. The knee-jerk reactions are far worse than any I have seen from a Christian anywhere. In fact, I'm still in search of those EEEEVIIIL Christians these people talk about so much, as I feel I have to examine both sides of the argument to keep from being too biased. Westboro church doesn't count, since nothing they do is in line with Christ's teachings. They're a revolting group of sad human beings. (There, I judged, so sue me. I might've also just contradicted myself, but that's depends on how you look at it.) I've also heard the "I've studied all the world's religions" argument before, as if I'm an unexposed backwater bumpkin (*snort* as if!). It has yet to take. I can go into a long explanation of why I still believe in spite of those other belief systems, but then that might make some heads explode here, so I won't. In some ways I can see you coming from the direction Jesus did. I mentioned before he was a rule-breaker in his time. The establishment, including the temple priests, hated him and plotted to bring him down. However, Jesus never criticized those who honestly got on their knees and thanked God in public, like in the temple, or in private. He encouraged honest worship, but never required a set structure to it. There are other ways to worship aside from on your knees and bowing your head and singing hymns (and I love singing hymns! ), and that's why I don't feel guilty if I don't show up in church every Sunday. There are times when you just have to be alone and/or do something with your hands, but there's nothing wrong with being still. A lot of times, letting go of a problem or a puzzle as if you're handing them over to an unseen set of hands and do nothing can help a great deal (had some great revelations doing that!). I don't know about your experiences, but I had periods in my life where God LITERALLY was the only friend I had. Even when I'm angry (and I was VERY often) I was glad that he allowed me to be angry, whereas people feel like they had to correct me, hand me seemingly simple solutions to defeating my personal demons. Though he's very hands-off (I suspect its because of that little thing called free will) he is always present and urges me to find the answers myself, leaving me clues when I go in a good direction and warnings as well, but its ultimately up to me whether I acknowledge them. People don't do that most of the time, and it can be very annoying when they push you in a direction you KNOW you don't want to go and know won't be beneficial. I didn't post this to lecture you. Your post simply prompted me to be respond. I'm trying to be a little braver when I confront skepticism as the "live and let live" philosophy as repeatedly failed me (its akin to making NO judgments whatsoever), making me feel like I'm giving up more and more ground each time I let opportunities slide. I need to stand up for what I believe, yet at the same time, not fall into the trap and devolve into irrational angry responses. I confess I did that once a long time ago, and it was mortifying. I ended up being the idiot, and therefore, perceived as "wrong" because of it. Its a great way to paint a target on your back. If what you're doing is helping people and gives you peace of mind, don't fall into the trap as I did and make it easier to for someone to exploit you, and also, refrain from becoming that exploiter. Its not anymore flattering. Yeah, I can be a rambler. I hope some of this made sense even if you didn’t agree. Don’t have time to structure it better. Lily, you are very wise. I had a whole post typed out yesterday in response and as I went to click on submit, it disappeared (I hate this laptop). But your response is so much better than mine. I just wanted to add that the verses about judgement cited above refer to judgement among believers in the Body of Christ, not non-believers. Alias is exempt from the judgement of believers, but will NOT be exempt from the judgement of God Almighty in the end. We cannot expect the same of non-believers that we must expect of those in the church. Also, Alias, your community and charity work are all well and good,, but God will grant no favors for it or for getting on your knees in worship. "For by grace you are saved through faith; and that not of yourselves, it is the gift of God: NOT OF WORKS lest any man should boast." (Ephesians 2:8-9) Please go back and study the words of God more thoroughly. Your eternal life is at stake. 18Yea, a man may say, Thou hast faith, and I have works: shew me thy faith without thy works, and I will shew thee my faith by my works. 19Thou believest that there is one God; thou doest well: the devils also believe, and tremble. regarding the judgement of "non-believers"
18 .... but he that believeth not IS CONDEMNED ALREADY, because he hath not believed in the name of the only begotten Son of God. Your reference to Eph 2:8-9 is correct but incomplete by itself. You have to use all verses that apply to this subject and connot just pick and choose. "Please go back and study the words of God MORE Thoroughly. Your eternal life is at stake." I was going to quote James 2, but was beaten to it. Of course, being the Christian Bible, it requires faith in Christ in order for these ideas to manifest...which I currently do not have. I appreciate your faith, and would lay down my life for you to have a right to it. As for my soul...I haven't finalized my opinion on that matter. Maybe Christians are right...maybe Muslims are...maybe I will be reincarnated as a barn swallow (which is my current favorite, although unrealistic, thought of continued existance after death)...who really KNOWS?? Thats where the faith comes in...and arguing over my eternal damnation because I don't have faith in the same (re: any) God you do is redundant and cyclical...because it is based on YOUR FAITH. You cannot prove your God to me...and I have not found Him for myself. Jane stated that I am exempt from the judgement of believers...and I have to thank you. As many times as I have had conversation on this topic, no one has EVER recognized how that works. And I can understand why. People hold so strongly to their faith they can't understand when someone doesn't hold the same view. It certainly isn't like saying "the sky is blue". I feel the same...only in reverse...and I know I really don't know. Hopefully I will find out. MY FAITH tells me that if there IS something after death, living my life with virtue and respect for others will allow me to walk with my head held high into whatever it may be. I am not looking to start an argument, I am not a troll and I am certainly not looking to offend anyone. I do enjoy having conversation with intelligent people on subjects that have some weight...and require thinking...and emotion...and passion. I like this blog...and the people who respond here definitely have some of the most well thought out conversation I have seen on a blog in a very long time. I hope I have not offended...nor annoyed. I just saw an opportunity to try and show that not all "non-believers" are intolerant. Although I may not be the BEST example of "non-idiot", haha! You're welcome :), and you never offended me. I pray that in your search for the truth, that God extends His grace to you and reveals the REAL truth, His Truth, and His saving faith. Lily...thank you for your reply. Your candor, personal insight, and relatable manner are wonderful! When I stated "I've studied all the world's religions" it was in no means my intention to infer anyone is "an unexposed backwater bumpkin". My apologies to anyone who felt that was connotated. I stated that fact so that you would understand that I have had some education regarding religion...and most specifically Christianity...and have not come to my beliefs through blind ignorance. Out of a true faith will come good works, and they are motivated by a love driven faith for Christ and what He has accomplished on my behalf. However, good works are NOT NECESSARY for salvation. James 2:20, 26 Same as above, works do not save, but out of faith spring good works, motivated by love for the Savior. Ephesians 2:8-9, in its context, means exactly what it says, BY GRACE ALONE, THROUGH FAITH ALONE, BY JESUS ALONE is salvation found. Good works should be part of the life of a believer, because of love for Christ, and obedience to Him, but not necessary to be saved. Scripture from James is misunderstood and misused by those promoting a works based salvation. If I am understanding you correctly you are promoting a works based salvation (using verses pulled out of James). You are in error as you have ignored other scriptures if you think that faith alone will save you. 21Not every one that saith unto me, Lord, Lord, shall enter into the kingdom of heaven; but he that doeth the will of my Father which is in heaven. Who will enter into the Kingdom of Heaven?? Those that do (see this indicates that actions are necessary) the will of God who is in Heaven. Yes, faith, repentance and trusting in Christ as atonement for sin is all you need for salvation. If God demands us to "do" things in order to be saved we are all doomed. None of us can do enough. Christ has done it all for us. Salvation is by grace alone, but it is not easy. It calls for knowledge of the truth, repentance, submission to Christ as Lord, and a willingness to obey His will and Word. However, we will all fall short many times, but fortunately don't have to worry, as salvation is secure. I think Alias has a better grasp of this than you do. Do you know if you've done enough of the will of God to enter the Kingdom? As far as Matthew 7:21 goes: Jesus is not suggesting that works merit salvation but that true faith will not fail to produce the fruit of good works. This is precisely the point of James in previously cited verses. Just for your information, I think Joel Osteen is a false teaching horse's a** that preaches a feel-good prosperity gospel. I would not want to be in his shoes come judgement day. What else would you like to presume you know about me? People of faith (whatever faith) are generally happier, recover from disease faster, and live longer than atheists do.